An affordable degree close to home brought alumni Psychology major Shannon Moriarity to Castleton’s classrooms. “I had heard many positive remarks on the education you receive here at Castleton, so I knew I was getting the most out of my money,” she said. Her interest in Psychology took root in high school when the topic of human behavior was presented to her in a class. Finding the study intriguing, she decided to pursue it further. After transferring to Castleton halfway through her sophomore year, she found the classes and experiences that would best push her towards a bachelor’s degree. Moriarity was able to conduct and analyze her own research and data to get a deeper look and understanding of human behavior in her Psychological Research courses. She worked closely with her advisor and Psychology Professor Dr. Terry Bergen, who guided her through some of her most important experiences. “Through his courses I was able to learn not just about the world around me, but learn about myself and who I want to become in the future. This can also be said about the rest of the Psychology department, as each and every faculty member is helpful, challenges your thinking, and guides you down the path fit for you,” she said. 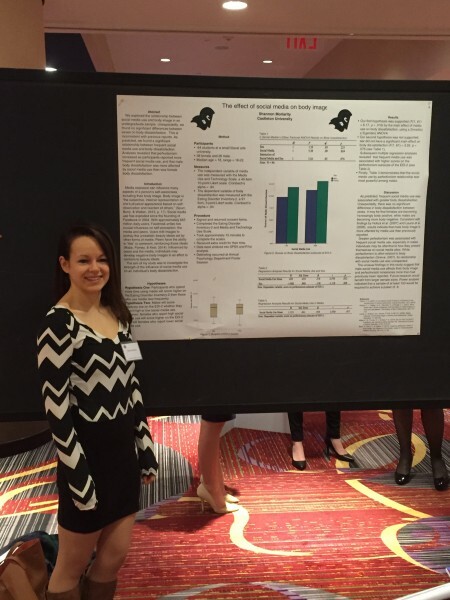 Moriarity was able to present her collected research at the Eastern Psychological Association conference in New York City, an experience she will never forget. With all of the support along the way throughout her academic journey at Castleton, Moriarity says that her professors and colleagues will be what she remembers most. “They challenged my thinking, opened my mind, and changed my outlook on life. Those lessons are much more important than the ones learned in the classroom,” she said.